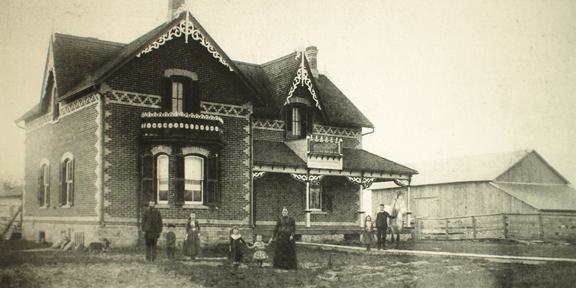 The Ferris homestead circa 1900. The original barn is on the right and the log cabin is just visible on the left. 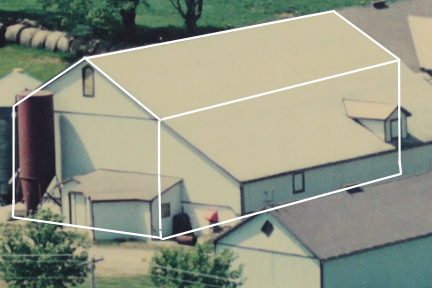 The outline of the original barn superimposed on the barn complex. In 1980 the Ferris Homestead became the Horner farm. The farm had been in the Ferris name since 1859. The first Ferris' came to Mulmur in 1854. They settled in Whitfield. At that time, according to Doris Ferris, "It was just a wilderness with only one road and it was just a trail. There were on horses and only a few oxen. The bush all had to be cleared before any cultivation could be done." Edward Ferris and his family immigrated to Canada in 1852. Edward and his son James purchased 150 acres between them which includes what is now the Horner farm. James married in 1866 and he and his wife probably lived in the log cabin which is just visible to the left of the house in the picture on the left. The brick house is thought to have been built in 1886 and it is possible that the barn was also built around that time. 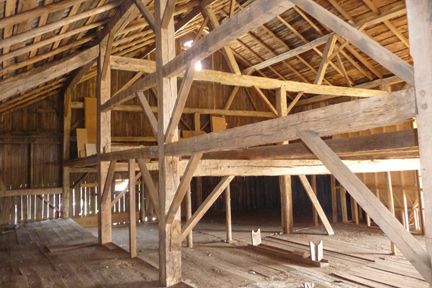 The area outlined in white at the left is considered to be the original barn. Four generations of Ferris' lived here before the Horners. This farm has been worked for 155 years. Like the Brown's barn, this barn has been taken down. Starting to take down the Horner barn. Brian Horner gave me two ends from beams that were in the main barn. These were incredibly hard and in 2011 I wasn't really interested in trying to do something with them. They were also elm and this wood can be very ornery. The beams were checked quite badly with some of the cracks going to the heart of the wood. However, on one of the pieces there was a support piece that went from the beam to one crossing at right angles to it. This piece was pine and from this I made a small vase. I have called the vase "Mulmur Echos" to reflect on the passing of the Mulmur barns on the one hand and to consider, on the other, that there are different ways of doing things now and that these buildings are redundant and falling into disrepair.